I'm not a fan of black coffee, but in a lot of ways that's how I like my science fiction: straight up black. Regardless of the story's quality, going in I have the expectation that it will "feel" like science fiction and nothing else. Kind of a strange attitude, actually, when you consider that I'm a fantasy fan as well. And what about the fact that I always drink my coffee with cream--and sometimes sugar? (Espresso is the exception as I will drink that straight once in a while, and I have this cute little set of white espresso cups and saucers...but I digress). It occurred to me one fine day that many of the "science fiction" stories I've enjoyed the most could be more accurately categorized as science fantasy. 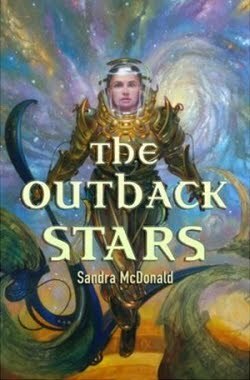 Too many to list, although in recent years, Sandra McDonald's THE OUTBACK STARS trilogy tops the, uh, list. Occasionally, one encounters a bias against science fantasy because it's not "real" science fiction. This past February, John Scalzi nicely articulated the schism (in reference to films) in his post, Science Fiction vs. Science Fantasy. Well, the naysayers can't stop me from either enjoying science fantasy or including it under the science fiction umbrella. Therefore, I invite you to visit the blog of author Tia Nevitt (formerly of Debuts & Reviews fame and now a debut author of the fantasy romance, THE SEVENFOLD SPELL) where I indulged in An Ode to Science Fantasy. I thought Tia's joint would be an ideal location for the post given her expertise in speculative fiction, and particularly in fantasy. Even better is the fact that when I invited her to guest blog here at The Galaxy Express on a related topic, she was totally game. So stay tuned for her guest post, which will appear tomorrow night.